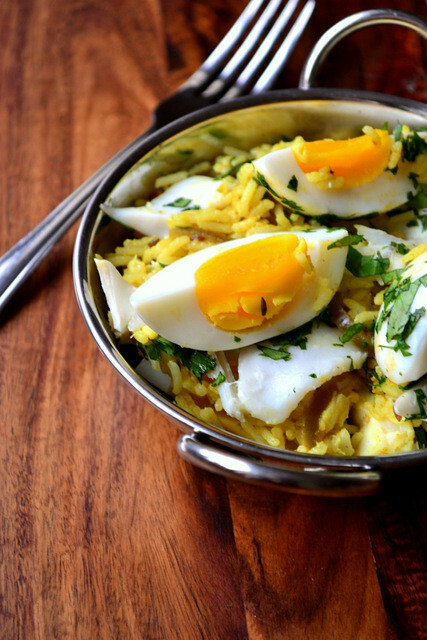 Smoked Haddock Kedgeree is a simple Indian rice dish, popularised in Britain during the 19th Century. 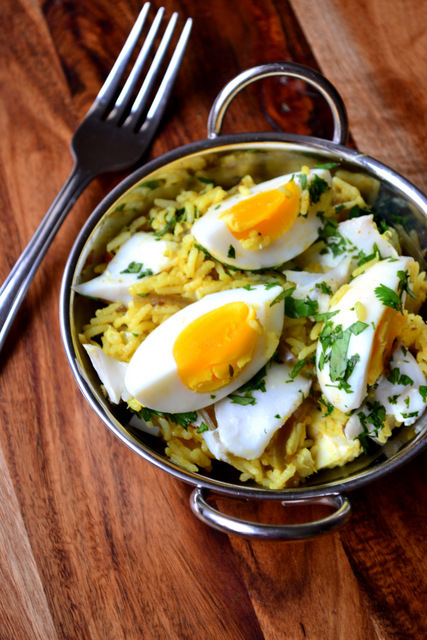 Though fundamentally a breakfast dish, kedgeree makes a great, quick comfort meal any time of the day. As with most popular dishes of this nature there are innumerable variations, most of them not particularly frugal. Quite frankly, 600g of fish between four, or even six, is unnecessary. There are so many interesting elements to kedgeree, that it seems a shame to allow smoked haddock to swallow them whole. 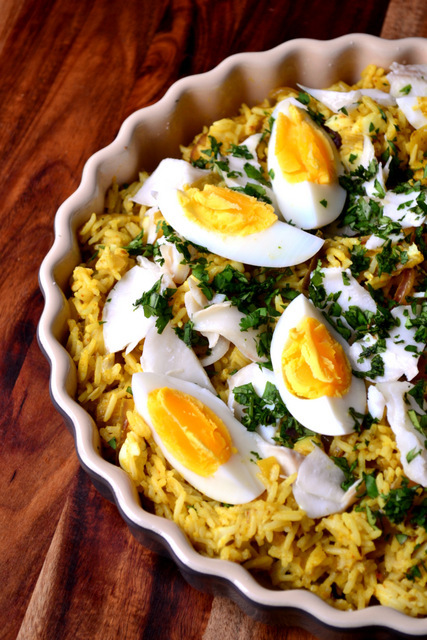 Flavoured relatively lightly with cumin and fennel and punctuated with quarters of eggs somewhere between soft and hard boiled, kedgeree is a surprisingly delicately balanced dish. 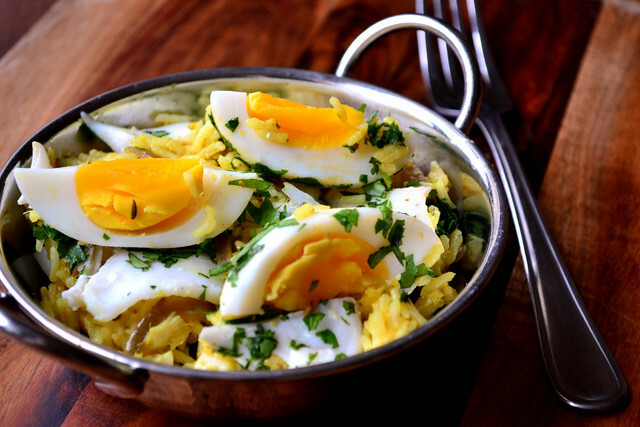 At its roots kedgeree, at least in Britain, is a frugal dish in much the same way bubble and squeak is. Particularly fashionable in the Victorian period, it would be made of yesterday’s leftovers, using up food that might otherwise go to waste. Place the smoked haddock, along with 500ml of boiling water and 2 bay leaves in a pan to simmer, lid on, for 5 minutes. Drain and set the fish aside to cool. While the fish is cooking pop the rice on to boil – you can use leftover if you have any – and begin frying the onion in the oil. To the onion add 1 tsp of the whole cumin seeds, followed by the turmeric, garlic and chillies. Grind the remaining cumin and fennel and add that to the pan. Pour over a splash of water to keep it moist and cook over a medium heat for 5 minutes. Meanwhile, bring your eggs to the boil. Once the water reaches a brisk boil they should take exactly 5 minutes. Add the cooked rice to the onions and spices and incorporate thoroughly. Flake the fish and stir half of it through, along with half of the fresh coriander and the salt. Transfer the kedgeree to a large serving bowl, scatter over the remaining haddock flakes and coriander. Quarter the boiled eggs and push them into the top of the dish. Sprinkle over the lemon juice and serve alone or with flatbread and salad. Cost: Though this is a recipe with a few more stages than usual, it is simple and the price reflects that. Smoked haddock is a relatively inexpensive fish, and eggs seem to be getting cheaper and cheaper. All told, this delicious recipe for smoked haddock kedgeree should set you back no more than £4.50. I’m beginning to think you are a mind-reader. Kedgeree is the other thing I have when I go to the Boston Tea Party (the other one being Eggs Florentine, by the way). II’l have to give this a go! Eggs florentine it is then ;). Please do, Brian. 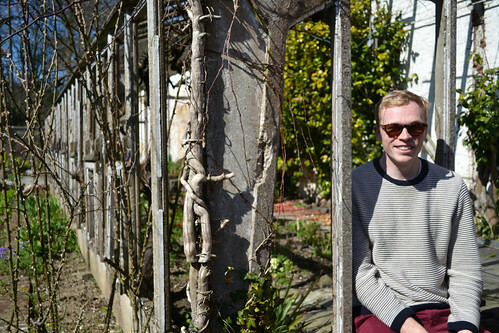 I’ll do my very best to keep successfully reading your mind. I think you summed it up nicely! Never had kedgeree before. It looks marvelous. I haven’t cooked a kedgeree in ages. The last time I had it was on a boat on the Shannon river about 30 years ago. It wasn’t very nice….